Does anyone know what the lowest altitude the Raptor Vacuum engine can safely be lit at? Now that the specs have been released, how does this really compare to the BE-4? I see it has almost twice the pressure, but the thrust is not off be nearly as large of a factor. Does this translate to a much lower fuel efficiency for the BE-4? Does this mean that BO would need a different engine to compete in the SHL market against the ITS booster? Raptor Turbopump and preburners arrrangement appears impressively compact. 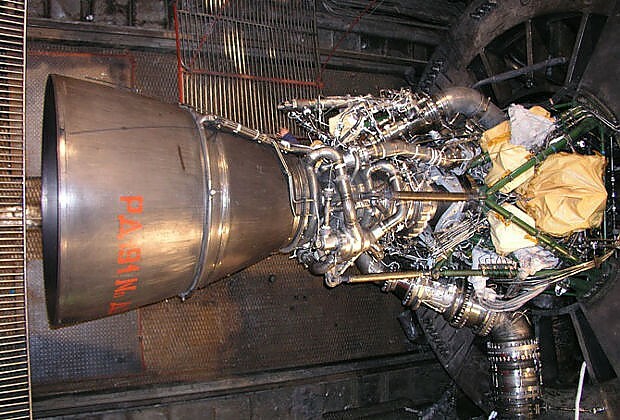 2001 RD191 had similar dimensions, Ø1.45 nozzle (I calculate Ø240mm throat given 37:1 area ratio) with 25.8MPa chamber pressure and 89 sea level T/W, latest 2013 design update RD193 https://engineeringrussia.files.wordpress.com/2015/01/130.jpg has T/W of 103. So what are educated guesses as to overall mass or thrust to weight of the 40:1 nozzle Raptor? Given all the potential savings that may arise from laser sintering manifolds without volume/mass compromises for joints and flanges I am picking a band of around 2000-2500kg (150-120 T/W). This would signify an engine that - according to Musk - is close to the size of Merlin but 4 to five times heavier. Also, I would love to know the mass/weight projection for the armor that this thing is depicted to sport in the CAD drawing. It looks there as pretty thick, and the light texturing suggests an aramid composite of some sort. Lower chamber pressure just means a bigger throat and lower expansion ratio for the same thrust at the same back pressure. Performance in a vacuum will be almost identical. Performance at SL will be a few seconds lower. Thrust to weight will be lower since the throat and chamber will be bigger for the BE-4. BE-4 will still be a competitive engine. Locking this thread as we have a new Raptor article and baseline thread via the same man who wrote this first one.